“In 1994, I had the tremendous good fortune of being invited to join Blue Highway as a founding member. I can't imagine a better opportunity for a young dobro player, and Blue Highway has been a stellar creative home for me for 21 years. So it is truly with a heart full of gratitude -- and more than a little sadness -- that I announce my departure from the band. There are many reasons that have led me to this decision, but it all boils down to the fact that 21 years is a long time, and I'm ready to put my energy into other musical projects. In recent years, I have done some touring in smaller ensembles. Those experiences really made me recognize how much more difficult it is for a larger band to deal with the complexities of travel, scheduling, recording, etc. The music is great, but everything that has to happen to get to that moment of creating great music is more complex and consuming. So I am taking this step to simplify things. It is just so much easier to travel and perform on stage with a smaller group, and that is where I'm planning to focus my energy for most of my upcoming live performances. See Blue Highway's related statement here. 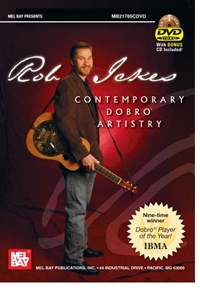 At the International Bluegrass Music Association's awards show, held held on Sept. 26, 2013 at Raleigh, North Carolina’s Duke Energy Center for the Performing Arts (Memorial Auditorium), Rob Ickes won his 15th trophy for Dobro Player of the Year. This extends his record as the most awarded instrumentalist in the history of the IBMA awards. The awards show also featured the induction of Tony Rice into the IBMA Hall of Fame, with an acceptance speech by Tony that no one who was present will ever forget. An exciting project hits the streets on September 16: Three Bells, a “dobro trio” CD by Mike Auldridge, Jerry Douglas and Rob Ickes. The album was recorded in a number of sessions during 2012, whenever their schedules allowed the three to converge to record together in a studio near Auldridge’s home in Silver Spring, Maryland. Douglas and Ickes said, "We (especially) want everyone to hear the incredibly powerful music that Mike has created for this project." Mike Auldridge is a 2012 recipient of the NEA National Heritage Fellowship, the nation’s highest honor in folk and traditional arts, and a 2007 recipient of IBMA’s Lifetime Achievement Award. 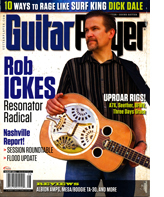 Guitar Player weighs in with a 12-page feature on Rob Ickes in the August 2011 issue. Rob Ickes and ResoSummit are pleased to announce that the first Houston Caldwell Scholarship is awarded to Bea Brackin, age 17, of Dalton, Georgia. This scholarship, established to honor the memory of Houston Caldwell, covers the ResoSummit registration fee ($420) for a young dobro player, age 18 and under. Additional support provided by an anonymous donor underwrites the housing and meal costs for the scholarship recipient. ResoSummit, now in its fifth year, will be held in Nashville from November 10-13. It is “total dobro overload” by design, featuring a stellar lineup of more than ten faculty members, two resonator guitar luthiers, and 100 participants from around the world, with three days of workshops plus evening performances at The Station Inn. I love the dobro because it is such a versatile instrument and very vocal. I enjoy bluegrass as well as new grass music, and hope to grow as a better player in many different styles of music. I hope to learn a lot more technique and ways of playing at ResoSummit. I believe that being around others who share my love of this instrument will give me new insight in how to play. I am so honored to receive the Huston Caldwell scholarship, and I am incredibly thankful for this chance to grow as a dobro player! Bea sent in audition videos playing the Josh Graves classic, Flatt Lonesome, and a Tut Taylor tune, Reso Fandango, that demonstrated her great affinity for the dobro. Like Houston Caldwell, Bea is a very involved, active and community-oriented teenager, and she will be able not only to benefit personally from the ResoSummit experience, but also to contribute to the remarkable sense of community and shared purpose that always arises at ResoSummit. In doing so, she will also help us all remember and honor Houston Caldwell, his many accomplishments and contributions, and most of all, the tremendous spirit and energy he shared with so many during his life. Congrats To Patty Loveless for winning the Grammy for Bluegrass Album for Mountain Soul II. Rob says, "I was fortunate to play on this CD along with my hero Mike Auldridge!" Watch the video for studio footage, plus commentary from Patty about her coal miner father. Rob Ickes and Jim Hurst will be performing in Greensboro, NC on Saturday, Feb. 12, and will be teaching a dobro and guitar workshop that afternoon. 3-hour workshop on Saturday, Feb. 12, 2011, 12:00 Noon till 3 PM. Location: String Studios, 604 South Elam Ave., Greensboro, Scott Manring's great teaching space. Cost: $80. Rob will teach a two hour class for dobro players; max of 10 in the class. Jim will do likewise for guitar players. For the last hour, the two groups will come together for a Q&A/demo session with both Rob and Jim directing the class. This special performance will be held at Mack and Mack, a great clothing design studio in downtown Greensboro, at 220 South Elm Street. Time: 8:00pm. Tickets ($20). ResoSummit 2011 will take place Nov. 10-13. Registration opened on Jan. 17 exclusively to those on the ResoSummit email list, and sold out that day. Every year, we are able to extend offers to many people on our wait list, so if you are interested in attending, we encourage you to sign up for the wait list. To make sure you get the first call for registration in future years, sign up for our email list. ResoSummit is pleased to announce the availability of a scholarship for a young person, age 18 or under, for ResoSummit 2011. This scholarship honors the memory of Houston Caldwell, whose short life was an inspiring testament to the transformative power of music and community service. The scholarship will cover registration fees, on-site housing and meals. To apply, contact ResoSummit using the contact info at left. United States Artists, an organization dedicated to supporting America’s finest artists working across diverse disciplines, announced the selection of Rob Ickes as the 2010 United States Artists Cummings Fellow at a celebration at The Lincoln Center on Dec. 7. USA Fellowship nominations are made by an anonymous group of arts leaders, critics, scholars, and artists chosen by USA. An expert panel for each discipline then chooses the USA Fellows to be recommended for approval by the USA Board. Previous USA fellows from the field of music include Michael Doucet, Bill Frisell, Ali Akbar Kahn, Terry Allen, Lionel Loueke, violinist Leila Josefowicz, jazz musician Muhal Richard Abrams, and interdisciplinary artist Meredith Monk. Katharine DeShaw, USA Executive Director, described the 2010 recipients as follows: "Chosen for the caliber and impact of their work, the USA Fellows for 2010 hail from 18 states and Puerto Rico, range in age from 32 to 71, and represent some of the most innovative and diverse creative talents in the country." Ickes is the first artist with roots in bluegrass music to be named a USA Fellow. His work spans multiple genres, and Ickes plans to use his fellowship to continue to explore "the vast musical potential that the dobro has to offer," and to raise the visibility of the instrument. Thanks for a great ResoSummit 2010! ResoSummit 2010 was truly Total Dobro Overload. Or, as one participant wrote in the survey, "Best. ResoSummit. Ever." Check out the highlights here. At quick glance, you might think this is an instructional DVD, but it's not entirely. It's a jam with Andy Leftwich on mandolin for ten tunes and the remainder are with jazz pianist, Michael Alvey. The range of music encompasses traditional fiddle tunes to jazz standards. Ickes expands the reach of resonator guitar as no other exponent of that instrument has done so far. His harmonic development tied to his melodic explorations on classic jazz and well-worn country favorites displays his limitless vision for the instrument. The DVD opens with Ickes and Leftwich jamming intensely on war horses such as "Angeline The Baker" and "Wheel Hoss" mixed with original tunes titled "Monrobro" and "Sanford and Son." They explore the nuances of each tune and the emotion inherent in each tune, and with "Blackberry Blossom," they are off to the races. On "Jack's BBQ Blues," Michael Alvey comes in and Leftwich goes out. Alvey lays down a barrel house vamp on the piano, supporting Ickes' melodic machinations and adding his own touches to each performance. With Alvey's presence things take a more jazz-tinged turn and this blues helps segue toward more sophisticated melodic and harmonic explorations. Ickes has shown in the past he is quite capable in this setting as he explores the melodies, gaining a surprised depth of harmonic voicings tuned in open chord and using a bar to obtain his note choices. "September Song," "Lullaby Of Birdland," "Some Other Time," and "Stars Fell On Alabama" are all noteworthy.